On Wednesday the Preppies had the chance to hear from two more of the Prep School Staff about their time in the Military. 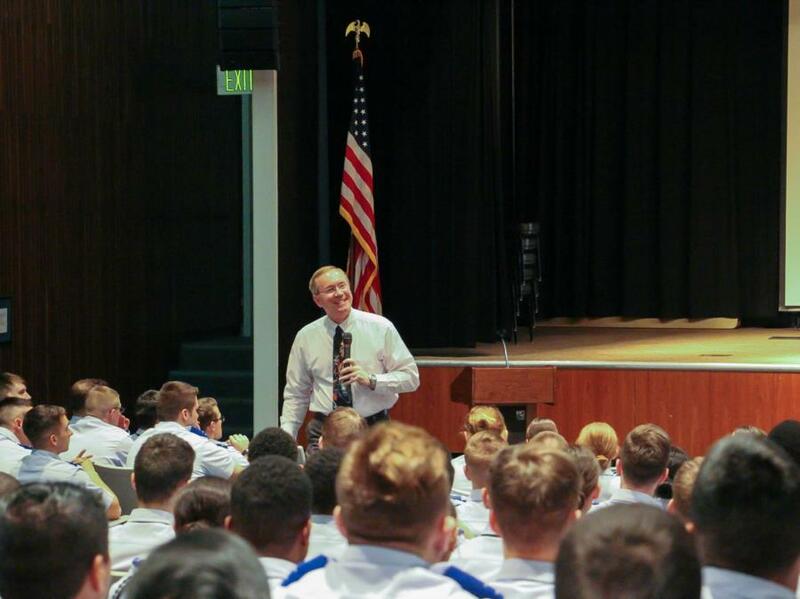 The C/C's heard from Lt. Col. Harris, who is the current Prep School Vice Commander as well as Dr. Mark Dibben one of the Science Teachers at the Prep School. Lt. Col. Harris talked about his Military Career thus far. He started by Majoring in Meterology. Which led him to some great jobs while he was Enlisted. To name a few; He was a Weather Observer, Forecaster as well as someone who briefed Aircrews. On the Officer side he was an OIC for a Combat Weather Team in Germany, and he even worked a Commander in the 607th Weather Squadron in Yongsan, Korea. He worked with other US Military Services such as the Army and the Navy. "Working with the Army was a completely different culture," he said. "You have to maintain your Air Force, your "Airmanness." He has spent time in many different countries during his Military career. Some of the countries he has been stationed in are; Germany, England, Korea and Bosnia to name a few. He talked about how he thought he would only be in the Military for 4 years and its now been over 30 since he joined the Air Force. When he retires he and his family plan on taking trips back to the places they've been stationed in to really enjoy the culture. "Expect the unexpected", "Do what you want to do, pursue what you want to pursue. But also know your limits." Dr. Mark Dibben commissioned through ROTC with a degree in Chemical Engineering in 1985 from the University of Kansas. One of the many jobs he had while in the Military was supporting Supersonic F-16 Ejection Seat Testing at Holloman AFB High Speed Test Track. 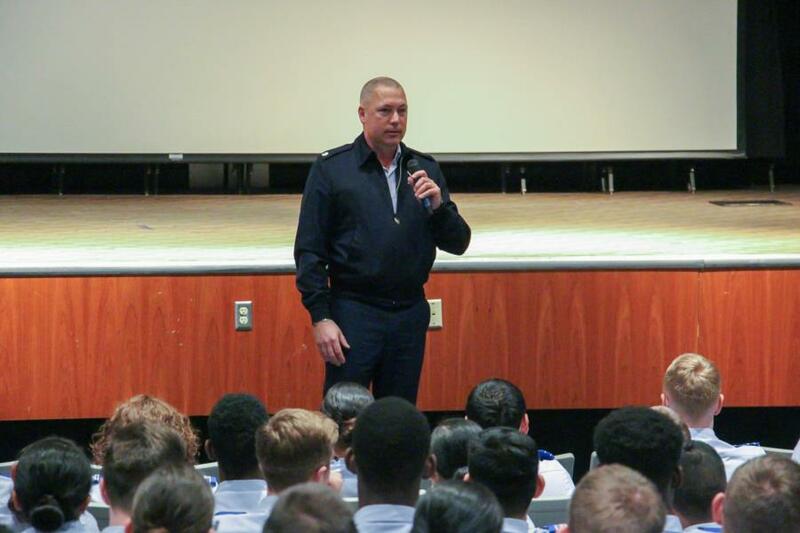 He talked about how at many points in the C/C's future careers they will have many choices, like he had with continuing their Air Force Career or continuing as a civilian in their field of choice if possible. Dr. Dibben finished his 4-year commitment after ROTC and almost got out of the Air Force but he applied to AFIT otherwise known as Air Force Institute of Technology and was offered a slot to get a Masters degree in Nuclear Engineering. With his degree he was able to work on the Space Nuclear Power TOPAZ-II Project which modeled disaster scenarios if a nuclear reactor crashed from space. He met his wife while working on this Project. He worked for Air Force Academy back in 1996 teaching Freshman Chemistry for a few years and later after getting his PhD and retiring from the Air Force, he started working at the Prep School and has been teacher here for the last 10 years. He also mentioned that after working at the Prep School he will most likely retire. To view the rest of the pictures go to Classes - Prep School - Military Training.